The SIU volleyball team came into the second day of the Notre Dame Invitational looking to bounce back from its first loss of the tournament Friday evening, but were swept in both matches of a doubleheader by Notre Dame and Michigan State University to finish 0-3 on the weekend. 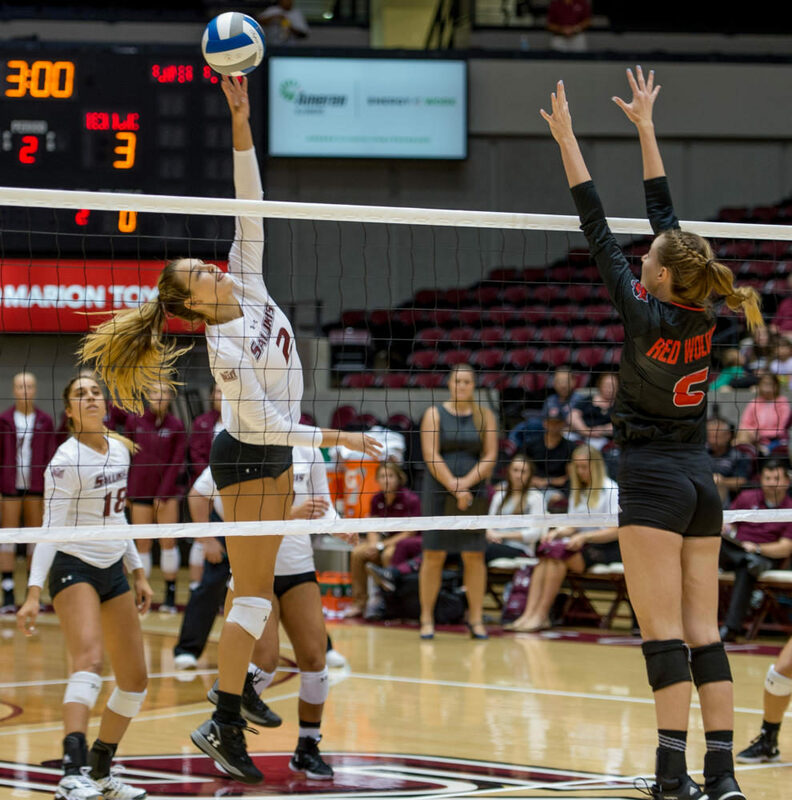 The Salukis faced tourney host and ACC-powerhouse Notre Dame in their second match of the tournament Saturday morning. This was the first time the two teams have met. Southern set the tone immediately with a kill by redshirt senior outside hitter Andrea Estrada, taking seven of the first eight points scored in the set to take an early 7-1 lead. Both teams traded points back and forth from that point, with SIU maintaining a healthy lead at 12-6. Notre Dame went on a four-point run closing the gap on Southern’s lead 12-10. The teams continued to battle, with the Fighting Irish riding the the Salukis’ heels and never allowing them to pull away. Notre Dame jumped ahead of SIU on the back of a four-point run to take the lead 22-17. Southern responded with a three-point run of its own, however the run was not enough as the Fighting Irish went on to take the opening set 25-21. The Irish jumped to an early lead in the second set and never looked back as they went on to take the second set 25-14 for a 2-0 match lead. ND once again charged into the lead, scoring seven of the first 10 points in the third set. The Fighting Irish continued to go on unanswered point-runs as they completed their 3-0 match sweep of the Salukis taking the final set 25-16. The Salukis came into their final match of the tournament against Big Ten opponent Michigan State University. Saturday’s match up was the second time the two teams have met, with the Spartans sweeping SIU in the first meeting. Michigan State came out strong in the first set taking an early 4-1 lead that was quickly matched by a three-point run from Southern, tying the match at 4-4. Both teams battled hard as they traded points, not letting either team gain more than two-point lead. The Spartans were able to create some breathing room as they went on a three-point run in the midpoint of the set to take a 14-10 lead. SIU was not able to make up the deficit as the Spartans went on to take the first set 25-22. The second set proved to be another close one as the two teams traded points back and forth. As Michigan State threatened to pull away, the Salukis pieced together a four-point run, putting them ahead of the Spartans with an 8-6 lead. MSU immediately closed the gap and started trading points with SIU once again for the majority of the match, leading to a 21-21 tie late in set two. Scoring four of the last five points, the Spartans were able to come out on top in the second set 25-22 taking a 2-0 lead in the match. Michigan State once again jumped to an early lead, this time never looking back as they went on to take the third and final set 25-20 completing the 3-0 match sweep. SIU finished the Notre Dame Invitational 0-3 through both days of the tournament. The Salukis were unable to win a single set in the tournament as they went 0-9 in sets on the weekend. Freshman outside hitter Maggie Nedoma led the team in total kills with 16 combined from both matches Saturday while also claiming four blocks in match one. Senior middle hitter Kolby Meeks had 15 combined kills while leading the team in combined blocks with a total of six. Senior libero Ashley Edelen led the team in digs across both matches with a combined total of 34. Freshman setter Rachel Maguire led the team in assists in match one with 15 while sophomore setter Alayna Martin claimed 16 assists in the second match. SIU (1-10) will play its first conference match of the season on Friday against Bradley University in Peoria. The match is set for a 7 p.m. start in the Renaissance Coliseum.